After visiting Gaeta (and escaping from the wind), we sailed to Castellamare di Stabia where we spent 3 nights in Porto Davide marina to visit Pompeii and Naples. Then we went back to Lipari. 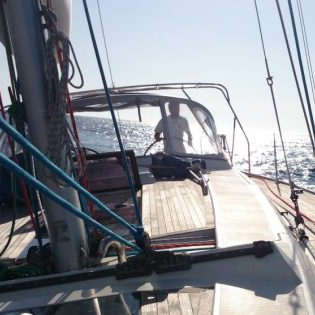 We wanted to spend one day to recover to the overnight sailing from Naples but we are finally staying in Lipari for some days until the wind give us a green light for Trapani, our next destination. We loved Gaeta, the view was beautiful, unfortunately the cathedral was closed and we were not able to visit it. When we are sailing we use the AIS. With AIS, we can see other boats and ships using AIS around us and we can adapt our course to avoid collisions. Sailing overnight from Gaeta to Castellamare di Stabia (passing through Canale di Procida) was quite an experience: we stayed close to the coast and we met many local fishing boats along the way. When sailing at night, you spot boats by their navigation lights but the lights give no information on the distance… so AIS is very comfortable in that respect: you get all info at once. Unfortunately, not all the fishing vessels have AIS (most do) and the ones that are using it are switching it on at the last minute (they don’t want to be tracked). Pierre had a busy night shift with good winds (and plenty of fishing boats), that ended with a beautiful sunrise over the Vesuvio. The first thing that I do when arriving to a Marina is to look for the automatic laundry, sometimes we do hand wash but this time we had too much clothes to wash so hand washing was not and option. The closest automatic laundry to Porto Davide was about a kilometre. After a 10 minute walk with 3 full bags, I discovered that this automatic laundry was closed. Finally, I took the clothes to the laundry, it was more expensive than the automatic but it was very nice to have everything washed, dried, ironed and folded. Give a try, at least once, it can make your month! Once everything was clean, we were ready to discover Pompeii, from Castellamare di Stabia we took the train to Pompeii and we spent the whole day there. The next day we went to Naples. The view from coast is amazing and napolitan pizzas (pizze) stand up to their reputation. Traffic is crazy, I was stressed every time we had to cross a road and the city was dirty (not as much as Palermo). We did not enjoy Naples that much (in fact, we preferred Palermo). We know that most tourists find charming the fact that parts of the city are left abandoned and that rudeness behind the wheel and horning is part of the local culture… but the cultural gap was too wide, we did not manage to cross it, sorry Naples. From Castellamare di Stabia we went to Sorrento, where we anchored for a night. This night was very uncomfortable: motor boats are passing fast and very close, making the boat slam in the waves constantly. And the sea in the bay is dirty: we have not been swimming for 5 days. From Sorrento , we sailed back to the Aeolians islands, passing close to Capri. We had another night sail, which went pretty good despite the week winds (hail to the Code Zero!). Pierre and I did our shifts and Marcos joined for the first ones. Spending all day with the kids is very tiring, we have days easier than others. At Pompeii they were very nice and in Naples they spent the day complaining. They were adorable during the crossing to Lipari, the 3 of them playing together. The anchoring/waiting time in Lipari is difficult, the 3 of them are requesting our attention at the same time. I recently finished the “Playful Parenting” book recommended by Nadia in the emotional explosion article. It is definitively a book to read when you have kids. I am experiencing with playful parenting at this moment. After your visit to Pompeii, I own a visit to Itálica, recalling our ancestors! !